What is SoFloMuslims.com? What can it do for me? What can I do with it? We’re glad you asked. The South Florida Muslim community is diverse and always expanding with dozens of halal restaurants, community masjids, youth groups, Islamic schools, cultural stores, specialized nonprofits, local charities, and all types of services performed by organizations and individuals. It’s easy to get lost in all that’s available—it’s even easier to stick to what you know. It’s natural to only want to attend your masjid, volunteer with organizations you’ve always volunteered with, and attend events hosted only by the people you know, and you’re absolutely free to do that. But if you’re looking for something different, something better suited to you and your family’s needs, something that may be able to help you grow past your comfort zone — welcome to SoFloMuslims.com. Across Palm Beach, Broward, and Miami-Dade counties, our community calendar has everything that’s happening in your community for Muslims. Find out about seminars, workshops, family camps, fun runs, health clinics, community dinners, youth groups, conferences, comedy shows, festivals, seniors events, volunteer opportunities, beach days, open houses, and whatever else the Muslim community can cook up! 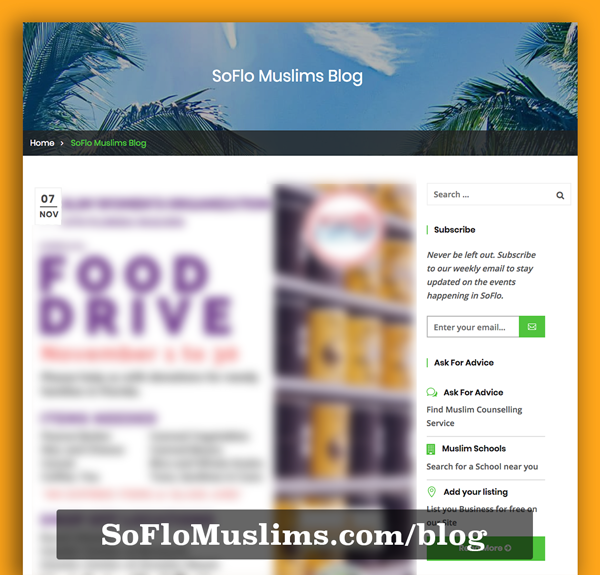 You can regularly visit SoFloMuslims.com/calendar, OR you can stay in the know right from your inbox with a short, weekly email from the SoFloMuslims newsletter (Subscribe here! One email a week. Never miss out on what’s happening). Don’t see an event you know about? Planning an event yourself? 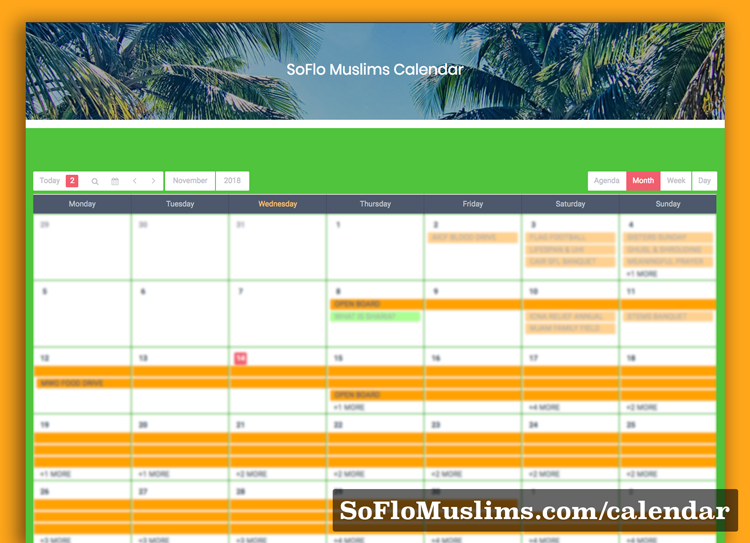 The community calendar is open for you to create your own event—just go to SoFloMuslims.com/calendar and click “Create Event.” Once submitted, your event will be posted on our calendar and the info will go out to our weekly newsletter with over 1,000 subscribers (and counting)! 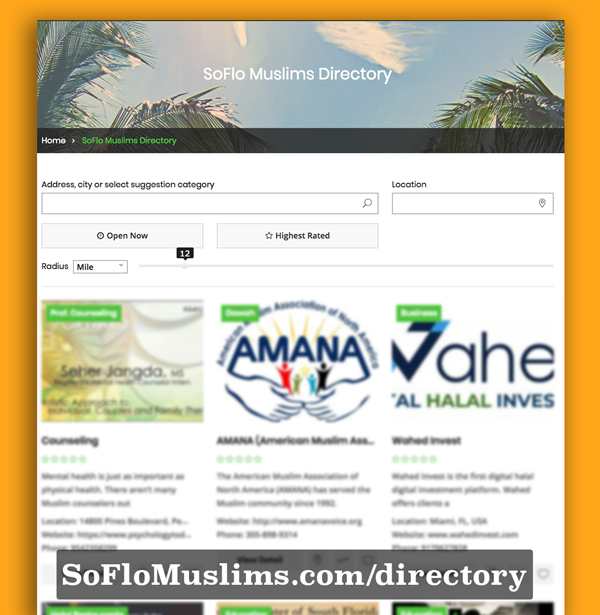 We’re trying to compile THE MOST COMPREHENSIVE directory of South Florida Muslim centers, organizations, businesses, restaurants, professionals, and more! While we have many entries that will let you check out what places and businesses are available in your area, there’s still many more we’d love to add. This is why our directory includes a feature for YOU to submit listings. All you have to do is click “Add Listing” at the top of the page. Whether you’re looking for legal, accounting, counseling, contracting services and more, our directory of Muslim professionals will help you find someone who can help you. If you’re looking for a place to pray in the tri-county area, or a halal restaurant to check out, or an organization to volunteer with, our directory is here for you. Beyond just listing your business or organization, any user can RATE and REVIEW any of our listings—let your fellow community members know your experience at a particular Islamic center (maybe add a tip, like “the sister’s section is upstairs”), or make recommendations for your favorite dish at a new restaurant, or even just provide a testimonial for a nonprofit cause you care about so others can see it and get involved. This feels like the start of a beautiful friendship. We welcome you with open arms to SoFloMuslims.com, and we hope you find the information beneficial and we hope it opens you up to EXPLORE YOUR COMMUNITY. To be a resource sharing hub that connects, empowers and serves South Florida Muslim organizations. It’s with that mission in mind we created this website for YOU. Please let us know what you think, how you’re using it, and what you think can be improved.